ETA: In taking a closer look at my dilemma, which is a high armhole, I went in search for tips and techniques on how to solve the problem. 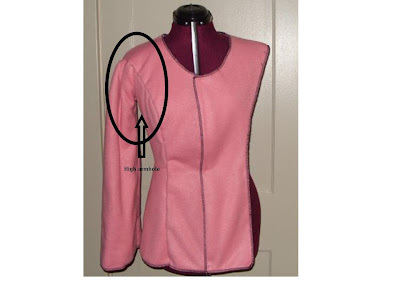 Most of the tips suggested altering the pattern piece prior to sewing. Unfortunately, some of the garment pieces have been sewn and other pieces baste stitched and basically trying to tweak it in its current state. What I really want to achieve is a lower armhole but not restricting arm movement. Since I've cut and baste stitched the garment already, I immediately thought to just undo the baste stitching of the sleeve and the front facing from the side pieces. Then taking the side pieces that are already sewn and laying it flat and scooping out about 1/4" from the side-back and side-front using the tailor curve. If any of this makes sense, I would be interested in hearing from you on how you would lower high armholes. Any help would be appreciated. My daughter wanted a funky & playful jacket and selected this pattern and a cotton candy fleece fabric. To top it off she opted for candy cane stripe fleece for the inside. Help me I am drowning in fleece....lol. So for now I am in pink limbo. That's gonna be cute! Love the color! I made this jacket twice, once for myself and I made my friend one for Christmas. Are you lining the fleece with fleece? If so I think it may be way to warm, the fleece is very warm. I didn't line either jacket and they're very warm. In any case good luck, can't wait to see your interpretation. Oh, I just LOVE this pattern. That's going to be very pretty when you finish it. I like your choice of colors. It has some pop. I will definitely tell my daughter that you all love the colors. I fought her tooth and nail about the colors...lol, but after an hour in JoAnns I gave in b/c its what she truly wanted. I am looking forward to seeing this done.. her color choice will certainly stand out!!! Love it! 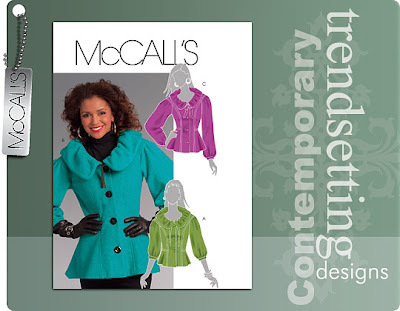 You can try scooping the armhole down and taking less seam at the sleeve seam. You won't a great difference, but it will be some. I would agree with Knitaholictoo. You will also have to make some adjustment in the sleeve. Perhaps first try loosening the sleeve cap to fit the new armhole line. Stitch it to the jacket to see if it fit/feel ok. I hope this helps. BTW- I've nominated you for the Sisterhood Award. Check it out on my blog!